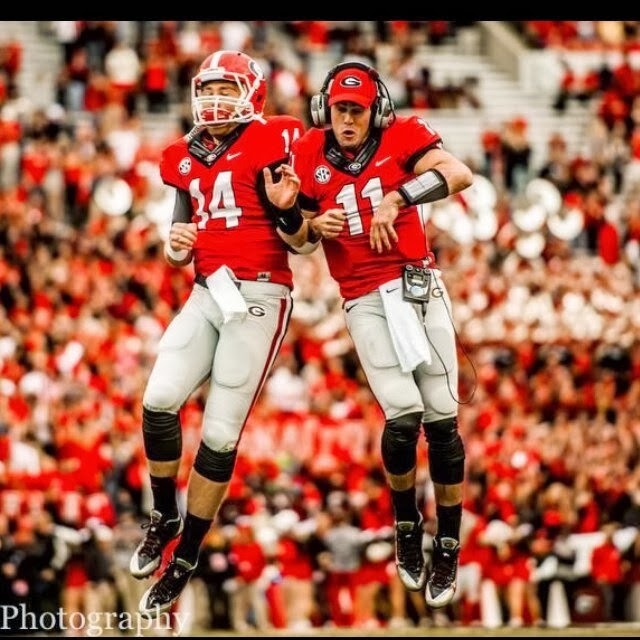 Bernie's Dawg Blawg: Hutson Mason, heir apparent? As the time of year dictates, I'm in the process of prioritizing an off season Georgia Bulldogs tackle football agenda; the things that need to be addressed and an order in which to address them. Or some fashion there within. But I think it is best to dive into this topic right away - the next quarterback in the post-Aaron Murray era and what the position looks like as #11 exits with all his yards, touchdowns and records. The passing of the huddle. What does the depth chart look like? Hutson Mason (Sr), Faton Bauta (RS Soph), Brice Ramsey (RS Fr), Jacob Park (Fr). Lemay's departure takes away Richt's ideal of having a perfectly staggered quarterback depth chart in terms of matriculation. Also of note, Parker Welch, the walk on that surpassed Lemay, has graduated along with Murray and fellow walk on Greg Bingham. So four scholarship signal callers, one of which is just now moving onto campus. What do we know for sure? Hutson Mason has the most experience obviously; he stayed on campus despite opportunities to transfer and will enter the spring as the clubhouse leader; in 157 attempts he has eight touchdowns, three interceptions and a 143.26 passer rating; Bauta is the only other quarterback with experience, albeit no attempted passes; he has four rushes for 30 yards in four total plays. What can we assume? Nothing. Except that Mason will surely start the Clemson game, barring something unforeseen this spring. He has some differences than Murray for sure, but he also is the one Bobo and Richt have the most familiarity with as their quarterback. And taking into account the history and what we know of Richt, he'll provide Mason every chance and more to take over the reins given the chances he had to leave the program altogether. Looking back to last week. the Gator Bowl was a mixed bag for Mason, as well as the fans watching with an eager eye (maybe too eager??) as to how he would perform with a month of preparation under his belt. On one hand you saw him dance around too much, make some bad throws, far fewer checks at the line of scrimmage than what we've grown accustomed to seeing, and overall have a game that was more forgettable than memorable. But taking a step back can give us a clearer picture. The weather was far below ideal, his targets (at least the ones he'll be throwing to in 2014) were mostly in sweats on the sidelines, his offensive line struggled on their way to giving up four sacks, and he still threw for over 300 yards. The biggest concern for Mason coming out of the bowl game (at least the way I see it) was the significant drop in completion percentage, 66% in three previous games to 53% against the Cornhuskers. And the fact that the only starting receiver with much experience (Chris Conley) was not even close to 100% as well as the sloppy field and rain, can more than explain that drop in passes completed. So, looking forward, I see little reason to worry, much less speculate as to whether Mason should be the guy heading into the 2014 campaign. I believe we will see some looks for Bauta. He provides a different skillset at the position that could be utilized as a change of pace. That is something that will be very interesting to watch this spring and particularly at GDay. But more directly, the most intriguing question in terms of the quarterback position will be how much Bobo adapts to Mason's style. We've heard #14 likes an up tempo pace. Can the offensive scheme adjust to that successfully? Or will Mason have to dial it down to match an offense that will surely feature a running game behind Todd Gurley? Probably a little of both. Something to keep an eye on as we surely read about all the comparisons to 2005 when another quarterback who had waited his turn to take over behind an established veteran finally found his time to shine. Shockley had a lot more snaps under his belt prior to getting his turn. Let's just hope the end results are similar with a trip to Atlanta again.